Facts of St George’s life have passed through the centuries growing in legend and myth. However, he must have been some character in his lifetime for his reputation to have survived for almost 1,700 years! There are many accounts giving what are believed to be the facts outlining the life of England’s Patron Saint. Below are the widely accepted ‘facts’ of St George’s life. He’s died for religious belief. The medieval legend of St George and the dragon is over a thousand years old. The tale goes that the dragon made it’s nest by the fresh water spring near the town, when people came to collect water, they inadvertently disturbed the dragon and so offered sheep as a distraction. After time, there were simply no sheep left to offer the dragon and so the people decided to chose a maiden from the town by drawing lots. When the results were read, it was revealed that the princess was to be the dragon’s next victim. However, at the moment of offering, a knight from the Crusades came riding by on his white stallion. St George dismounted and drew his sword, protecting himself with the sign of the cross. He fought the dragon on foot and managed to slay the beast and saved the princess. The people were exceptionally grateful and abandoned their pagan beliefs to convert to Christianity. 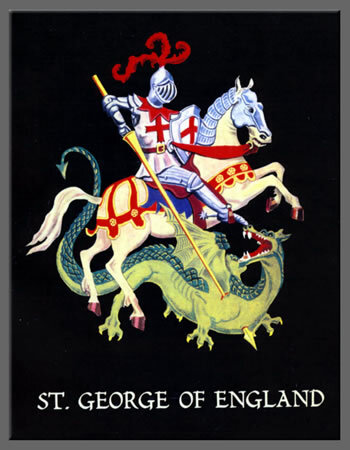 Saint George’s Day is the feast day of Saint George. It is celebrated by various Christian churches and by the several nations, kingdoms, countries, and cities of which Saint George is the patron saint. Saint George’s Day is celebrated on 23 April, the traditionally accepted date of Saint George’s death in AD 303. As Easter often falls close to Saint George’s Day, the church celebration of the feast may be moved from 23 April. In England, where it is observed as a solemn feast, for 2011 and 2014 the Anglican and Catholic calendars celebrate Saint George’s Day on the first Monday after Easter Week (2 May and 28 April, respectively). Similarly, the Eastern Orthodox celebration of the feast moves accordingly to the first Monday after Easter or, as it is sometimes called, to the Monday of Bright Week. This entry was posted in England and tagged England, St. George's day by Susanna. Bookmark the permalink.